Nice editing! Be careful where you put the line. - Whatever the “progressives” accuse others of is what they are very much guilty of themselves. They project their own failings onto others so much that it’s become normal to them. Ezra, Tell Laura Loomer to quit acting like an anti free speech social justice warrior snow flake. Her actions at the Trump assasination play were just that, and were not representative of The Rebel supporters. At least I hope not. Ezra, Tell Laura Loomer to quit acting like an anti free speech social justice warrior snow flake. Her actions at the Trump assasination play were just that, and were not representative of The Rebel supporters. At least I I hope not. 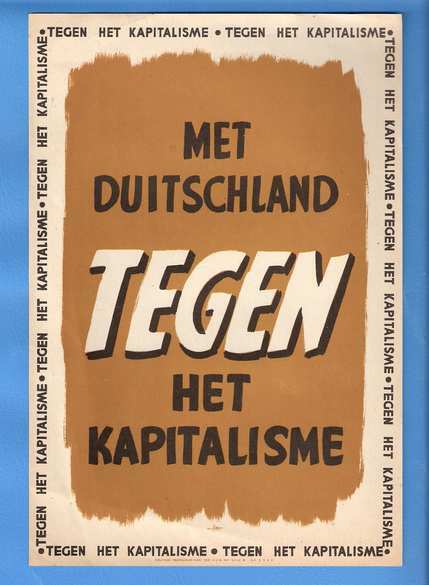 Here is another leaflet dropped over holland decrying them being sold and betrayed to their “Capitalistic Lords”. But I know all the evidence in the world will to convince a lefty. John, Here is an original Fascist pamphlet ranting against the Capitalists. Nazi’s are right wing, right. Give your head a shake. Well, Jmmy, its because (wait for it)- Candaland aren’t real journalists! I’ve been waiting so long to say that. TAMMIE PUTINSKI-ZANDBELT commented 4 mins ago I am re- posting it here too as the trolls post the same garbage on multiple threads. …nobody is going to get away with attempting to change language to suit their needs. NAZI has always been a totalitarian LEFT wing party. You do not get to redefine it for your needs. If you don’t know the difference between a ‘social’ conservative and a ‘socialist workers party’ you are either an idiot or a fascist trying to silence people you are sorely underestimating. A nazi is a nazi, and Anders Breivik and the sicko who murdered Jodi Cox, were LEFT wing nutjobs. Further proof that the left perpetrate the violence. You are attempting to equate people reacting verbally to violent left wing attacks with actual violence. ONE: voicing raw emotion in response to a murderous attack is NOT violence, and TWO: refusing to be an apologist is not hateful. You are just trying to save face for bringing up two cases which blew up in your face. Give it up. Nationalsozialistische Deutsche Arbeiterpartei (National Socialist German Workers’ Party. John doesn’t know that there is no such thing as a ‘right wing’ SOCIALIST. …and the master baiter attempts to re-write history. John Siciliano going down. Are you having some kind of breakdown John, you sound unusually feeble and your posts are lacking their usual bravado. You should take a long break somewhere quiet. Get a grip man. ha, ha ha,ha! John you are so twisted. You pull up a Wiki that anyone on the planet can write that lies about the National SOCIALIST German Workers’ Party and claim it is proof that the Nazi party was far right. Not only was Hitler’s party a SOCIALIST party, but the ideas he wrote about in “Mein Kampf” were all very socialist. His actions before and during the war were all towards the goal of Nazi socialism! It has been proven that Hitler and his party were socialists. You are push an old lie and you look like a complete idiot pushing this crap. John Siciliano – Your choice of sources tells us a lot about you. Your refusal to accept the history that fascists and communists are both brands of socialism tells us more. You’re welcome to your delusions (including “The right wing neocons meaning the whole party is very much hateful,”), but we’re not coming along for the ride. We on the right are very aware of the differences between race and culture. The war with Islam is because of culture – because many of them insist we have to follow theirs. We have 1400 years of history as the basis for our beliefs, supported by relatively recent referrals from Islamic leaders like Osama Bin Laden referencing things from 800 years ago as reasons for their actions. You have your feelings on your side. Is Islamic terrorism a realistic threat to the lives of every one of us? No. But neither are lightning or tornados, and that doesn’t mean you should go running in open fields carrying metal golf clubs during a storm. It’s called taking reasonable precautions. The right wing neocons meaning the whole party is very much hateful, not like the old days when there were two conservatives parties one moderate and one populist party. The right wants to demonize and like I said before people that commented on Blazingcarfur want death for Muslims, and some on Blazingcatfur wanted death of people in that burning building in London, England. The URL below clearly shows that the right wing is hardly religious, tolerant and kind by their words, actions, and imagery as can be seen from this URL site I am posting below. In fact, the Soldiers of Odin in Canada are also another example of right wing extremism on the rise in Canada against Muslims, immigrants and trying to create a culture of hate and scapegoating. That is demonstrated by the URL at the top showing a rise in Muslim hate crimes since Harper’s hotline idea in 2015 which Leitch supported. Another example of the right’s obsession with hating Islam all just to gain soft votes from people that love to scapegoat instead of wanting to fix the problems caused by the big banks in 2008-09 during the economic crisis caused by the Americans and the big banks. Fascism is also a far-right ideology, while communism is far-left. Thought I’d correct that and Wikipedia gives enough information about how each section of the spectrum and how they work unlike Rebel which never differentiates anything, and you clearly know nothing about ideologies, political science and knowledge encompassing anything. https://en.wikipedia.org/wiki/Nazi_Party – This proves that the Nazi party was and has always been a far-right party. Right wingers on the right and far-right by definition are for scapegoating, anti-immigration, social conservatism and Third Positionists are far-right. Just look at Franco’s Falangism. It took the same anti-communist, anti-socialist, anti-liberal, anti-globalist and anti-capitalist positions as Hitler’s Nazi party just done in Spain. Social conservatives are also very anti-progressive and the fact that they were for a racial party is another tenet of the right to far-right. They also advocated dictatorship and massive militarism and patriotism. Patriotism is normally a tenet of the right wing to far-right. Keep drinking that kool-aid John Sisillyanal. I thought the rebel was suing the guy who struck Sheila. Thank you Ezra for your comment on not being convinced that people should be “locked up” for being a little quirky and for saying to Lorne not to joke about it. I am a living example here in B.C. how the Mental health system can trap people for the rest of their lives with poisonous drugs and involuntary confinement. It has been twenty years for me in this situation after being diagnosed with Schizophrenia at 17 for laughing in my High School Science class that the Government has not left me alone ever since even though I have changed a lot from then by learning how to properly live by reading the Bible, becoming Conservative, going to College to become a Carpenter, having my own small construction business and also not harming myself or anyone else in that twenty years. The Establishment uses mental illness diagnosis as a political weapon like what happened to Kanye West after he spoke up about siding with Conservatives and Trump and also is reckless with their diagnosis’ at least here in B.C. where even the CBC did a story on ‘Psychiatric Refugees’ Fleeing British Columbia to escape involuntary commitment and forced druggings. My warning to all reading this is try your best to not let the Government get a foot in the door in your life regarding Mental health because once they do your rights as a regular citizen are taken away and then now they who “know best” for you get to make the choices on what gets put into your body and when you need to be locked up in the Hospital. Oh…and Kelly Weber, do try to keep up. Comprehension must not be your forte. Speaking of far left wing extremists.